I’m just splashing colours to the page right now. Different brands of crayons, acrylic, watercolour and pens. I love making the backgrounds, not thinking about the outcome just doing what I feel and feeling that I like the outcome. There are no rules to art journaling – just your own aesthetic judgment and the feelings you have while painting (or the feeling that comes to you while you paint). I almost never have a plan for the page, I just write what comes along in my brain and this time these pages is what came out. Journaling inspiration can be found here, here and here! Yummy stuff, check them out! 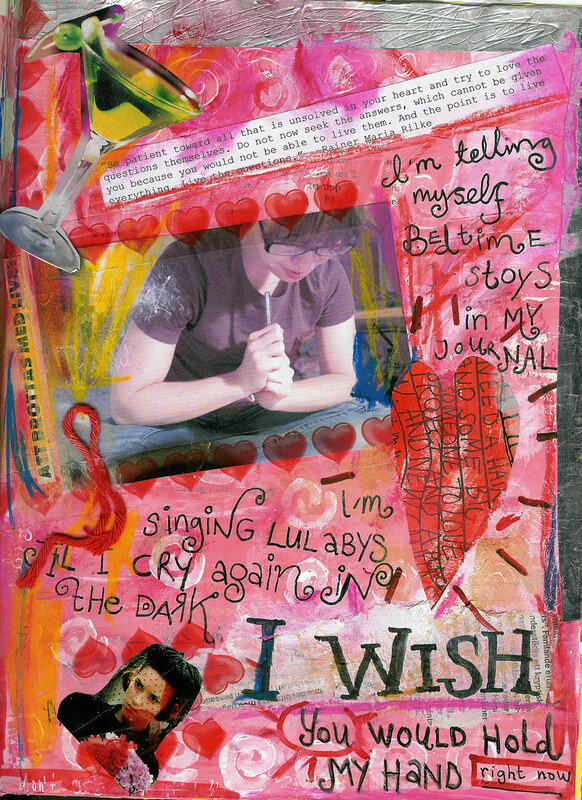 This entry was posted in A Creative Life, Art journaling, Collage and tagged art journal peek. Bookmark the permalink. Love all the swirling color and thanks for sharing the links. Plan on sitting down with my coffee cup and going through them. Pink and red are one of my favourite combinations, I love the bold colour palettes, the one that clash at first sight but then they seem so vivid and so in place. And the page with hands is such a bold statement. I have a question — how do you prepare backgrounds in advance? Unless you’re using separate pieces of paper or more than one journal, it seems to me they would all stick together. I like the first reference (moleskin), but the other 2 are very thought out. I can’t work like that or nothing will flow. Joanna Thanks, I usually feel i need to add more, and lots of words, but the hands do really speak for themselves huh? Good. Ninacolors When I’ve finished a spread I turn the page and paint it so that it can dry until next time. Sometimes I open the book and paint a page in advance without adding to it yet. Sometimes I prep a page by using crayons and that’s not very messy… :-) And about the links, I think you can get a lot of inspiration from looking at art even if it’s not what “you” do yourself? !